6:30 p.m., doors open at 5:30 p.m.
Free and open to the public – Arrive early for seating. First Come, First Served! The changes in what Oregonians ate, and how they prepared it, are visible in our regional cookbooks and recipes. 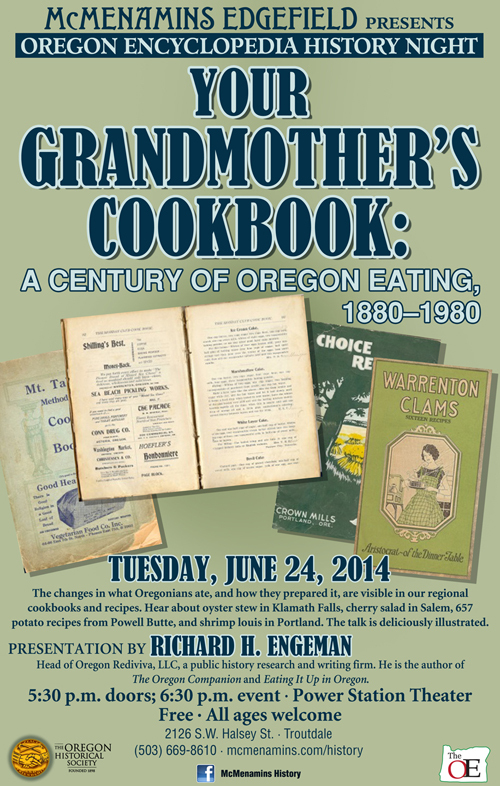 At this OE History Night hear about oyster stew in Klamath Falls, cherry salad in Salem, 657 potato recipes from Powell Butte, and crab Louis in Portland. As Oregonians are expanding their patronage of farmers’ markets, investing in heirloom vegetable seeds and seeking out locally-sourced restaurant meals, they are also searching for connections with the foods and recipes that sustained those who lived here a century ago. This search has inspired a new field of regional food history—of Oregon foodways—to examine questions about what we ate and how we prepared meals. Historical cookbooks are one source for food history along with other evidence such as menus and promotional leaflets that help trace the path of Oregon foodways from the railroad era of the 1880s into the late twentieth century. Richard Engeman is a regional historian and a former archivist and university librarian. A native Oregonian who grew up on the North Coast, he is particularly interested in the region’s transportation and architectural history and in Pacific Northwest foodways. Richard is the author of The Oregon Companion: an Historical Gazetteer of the Useful, the Curious, and the Arcane and Eating It Up in Eden: the Oregon Century Farm & Ranch Cookbook. Sounds fun! Is Edgefield going to cook us up some of these recipes for after your presentation?